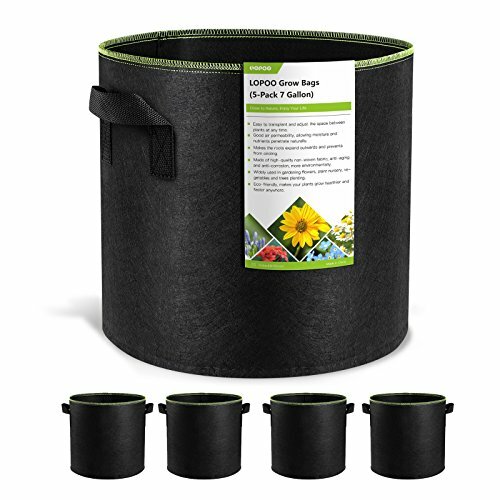 Fabric pots enhance oxygen, and allow roots to breath and grow healthier. Decrease the risk of transplant shock, and improve overall root structure. Keeps plant warmer in winter and cooler in summer. Lightweight grow bags take up little space when not in use. Non-woven fabric, sturdy stitching, reinforced handles for better wear resistance. Healthier Root Development: Prevents roots from circling and provides optimal moisture and keep plant warmer in winter, cooler in summer. Environmental material: No-woven fabric material automatically percolate excess water. Environmental and reusable, which can be used more than 10 years. If you have any questions about this product by LOPOO, contact us by completing and submitting the form below. If you are looking for a specif part number, please include it with your message.